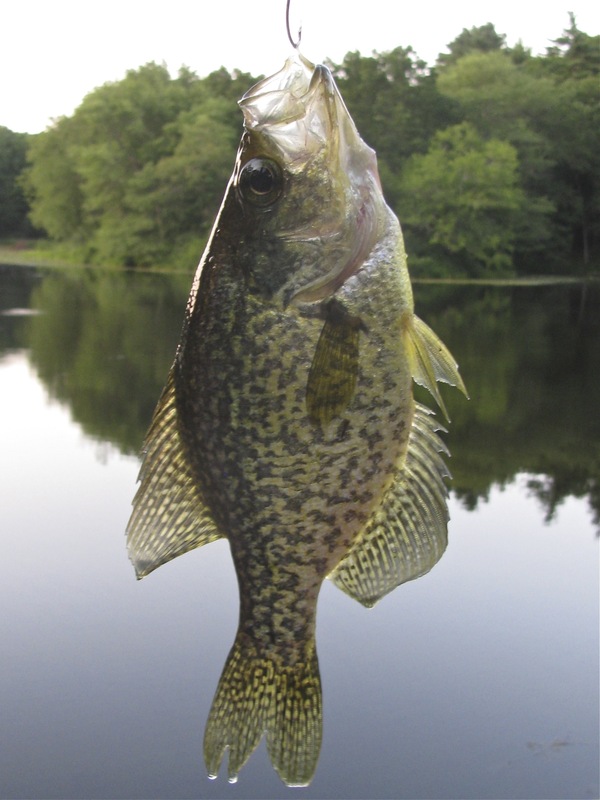 Comments: Crappies are a popular sport fish, as they are easy to catch when they are feeding. As with other freshwater species in Massachusetts, crappies accumulate mercury in their tissues as a result of environmental pollution from power plants. 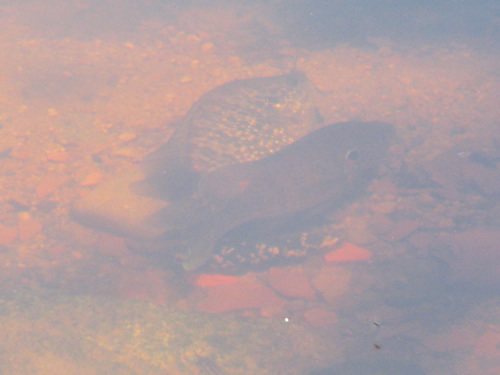 Comments: This bluegill sunfish was guarding its eggs. 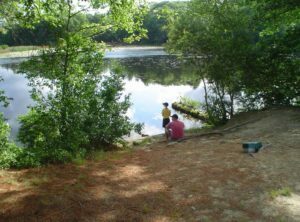 Comments: These sunfish were spawning on a sandy area near the shore. 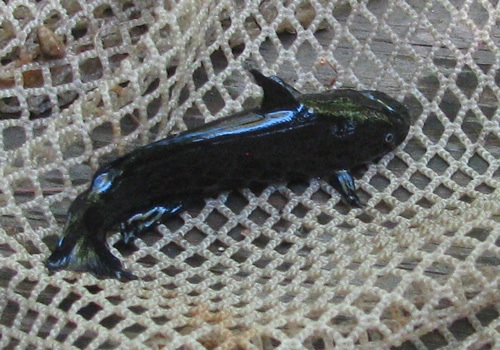 Comments: I noticed a number of small black fish swimming near the dam, so I got a dipnet and caught this one (don’t worry, I released it alive!). 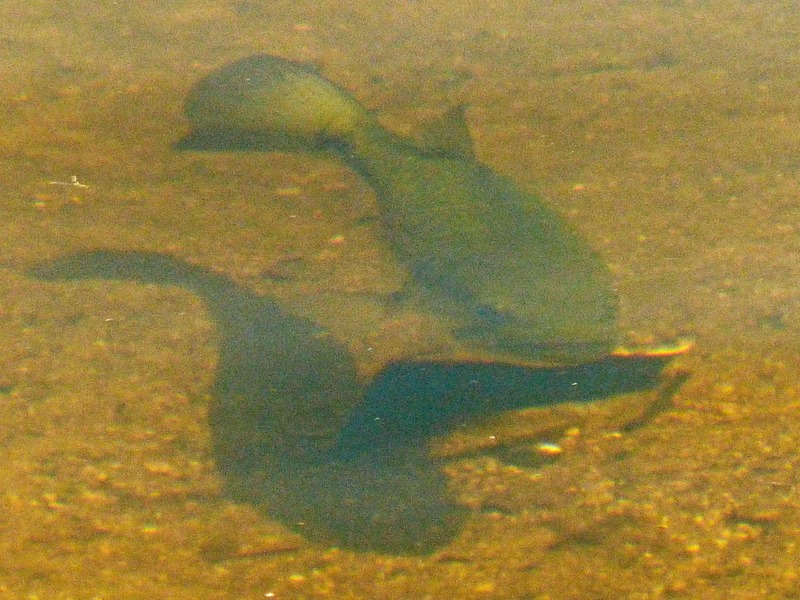 It turned out to be a bullhead catfish. 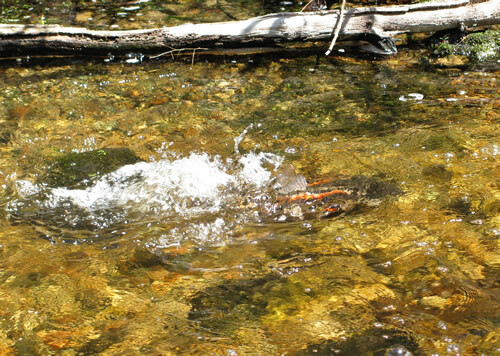 When the Department of Fish and Game sampled the fish in Beaver Brook on August 25, 2008 with electro-shocking equipment (which stuns but does not kill the fish) they found redfin pickerel, sunfish, bass and American eels, but they did not find bullhead catfish. 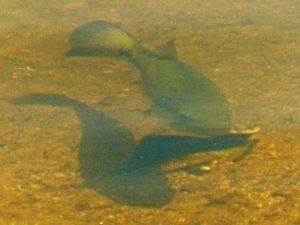 Comments: There are some big largemouth bass in Lake Massapoag, which also supports a population of smallmouth bass. 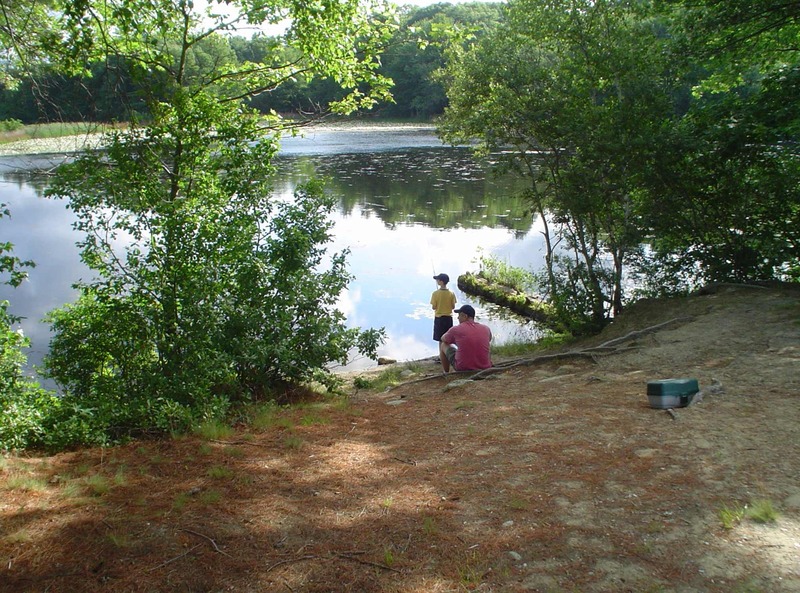 Largemouth bass are also present in smaller ponds in Sharon but smallmouth bass require cool, clear water so they are found only in the spring-fed waters of Lake Massapoag. 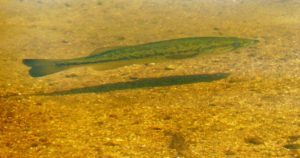 Comments: Redfin pickerel only reach a maximum of about a foot in length. They are typically much smaller—this specimen was only about 4″ long. They are common in Sharon’s streams. 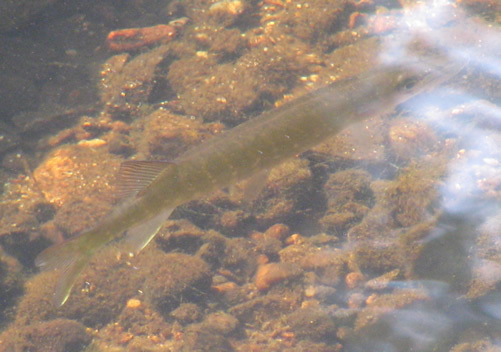 Preys on invertibrates and smaller fish. 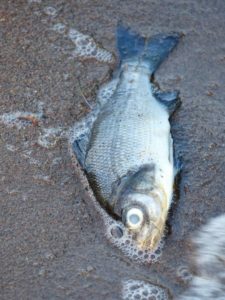 Comments: There are lots of white perch in Lake Massapoag. This one died and washed up on the shore. Comments: White suckers in spawning frenzy in Beaver Brook, 4/25/09. 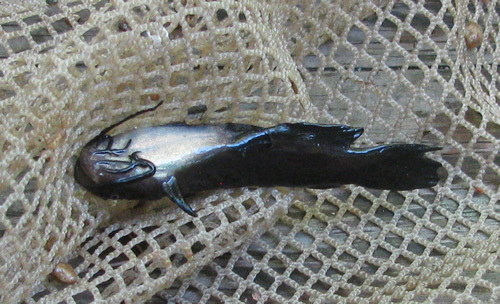 Note the red stripes and erect dorsal fins. 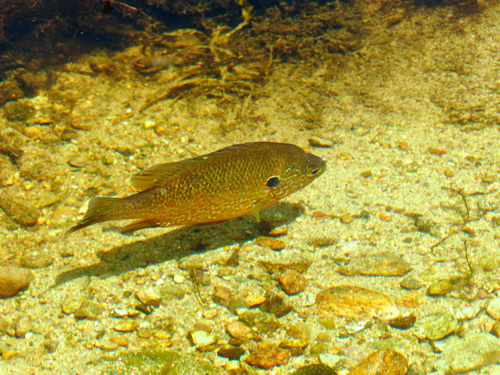 Suckers typically spawn for a few days sometime between April 15 and April 30. They also spawn in Sucker Brook where it enters Lake Massapoag near the entrance to the Community Center.